If you walk the levee behind the Palm Springs PetCo and look toward the mountain you’ll see them, but barely: four little rock houses. It looks like boulders tumbled down the hillside and assembled themselves into a hamlet out of a children’s story. Aside from one new roof–suggesting occupancy–you’d think the structures were vacant and about to be bulldozed to make way for luxury homes. I’d puzzled over the hamlet many times over the years. Then I puzzled some more when I heard that Christina Lillian, the glamorous arts patron and friend of Agnes Pelton, had once owned them and rented to artists such as Burt Procter. These four miniature houses are at an intersection where desert art and architecture meet. As I began to search, I discovered that our own Hopi Village (as the builder called it) is in danger of disappearing altogether due to its very hiddenness. A home at Andreas Canyon Club. Security Pacific Bank Collection/Los Angeles Public Library. In addition to Araby, Miller built homes in the secretive enclave above the Indian Canyons, the Andreas Canyon Club. 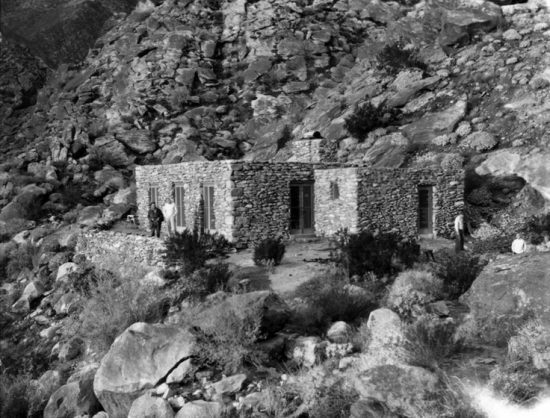 The private community, founded in 1923, features dwellings that grow right out of the rock, camouflaged like reclusive desert animals. “No one knows they exist because of the way Miller built the houses there–they literally disappear on the hillside,” Les says. If there is an architecture native to Palm Springs, I’ll vote for Miller’s twin creations: the Araby rock houses and the Andreas Canyon Club. (Miller purchased 330 acres above Ramon Road from the photographer Fred Clatworthy and had a plan to build yet another hillside village there, but it was never completed.) Why, then, in an era of unprecedented architecture worship, is R. Lee Miller forgotten? One reason is that his own story is elusive. Like his hillside dwellings, he was good at disappearing. Robert Lee Miller was born in Hill, Texas in 1887. 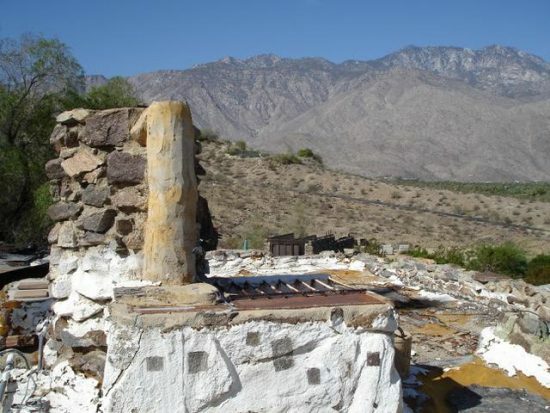 He served in World War I and trained in civil engineering, then turned to carpentry when he came to Palm Springs–according to the Palm Springs Citywide Historic Survey (link below). 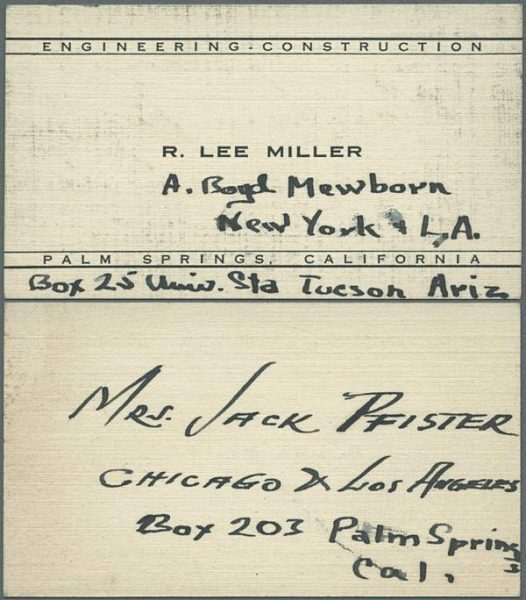 He had no formal training in architecture, yet built many early Palm Springs residences, including the Lawrence Davidson home in the Mesa, constructed for the president of US Steel. This was once the residence of nursery owner Earl Neel and is now home to talk radio personality Joey English. He built a home next to present-day Moorten’s Botanical Garden for the actor Reginald Owen, and the Casablanca adobe for Pearl McManus, as well as many others. But we’ll leave it to an architecture fan to document the full range of Miller’s contributions. Here we’re interested in his Indian houses, as they were called. 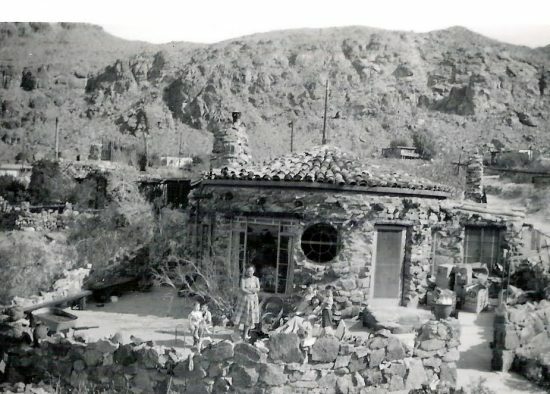 The first house was completed by 1925; in 1929 the Desert Sun announced that Miller was building his Hopi Village on 20 acres of hillside he owned in Araby. Before I say more, please be advised that there is no public access to the rock houses. Once you come to the gated dirt road, you are trespassing and the local residents are quick to call police. The best way to get a glimpse of Miller’s creation is from the Araby wash or the levee behind the Smoke Tree Commons shopping center. The structures look too squat for standard humans, a feature that has led to various Lilliputian legends that are passed down in Palm Springs high schools. A student who wrote a paper on the topic, Ariel Zepada, says the four-home village reminds him of The Shire, J.R.R. Tolkien’s idyllic hobbit town. Why did Lee Miller build a Hopi-hobbit colony of Araby rock? Because he left so few clues, we simply don’t know. 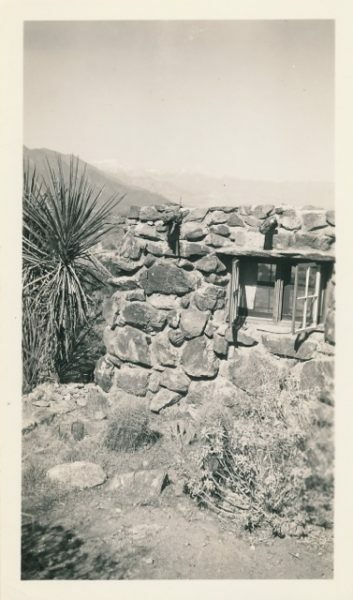 We do know that Cabot Yerxa later built his own Hopi-style house in Desert Hot Springs and that he was friends with Burt Procter, so he must have visited the Araby houses. Cabot may have even borrowed the idea from Miller. The borrowing from Hopi and Navajo culture was common at the time. Many local artists were also going off to seek inspiration with the tribes. 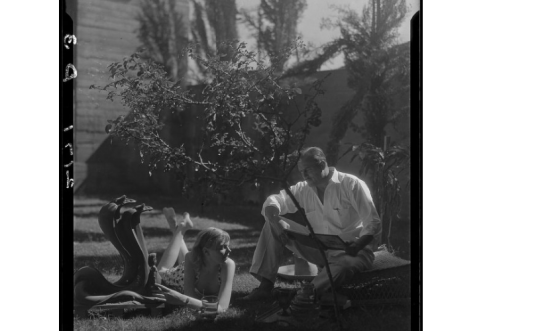 An archival photo shows R. Lee Miller, “noted artist-architect”, with Mrs. Jack Pfister of Chicago: “Sun bathers inaugurate the winter season at Palm Springs, America’s Sahara.” They are seated on Miller’s patio, with Miller dressed in crisp resort wear. Both the photo and the society columns suggest Palm Springs gentry. Miller’s Araby houses were more boho than garden party in style. 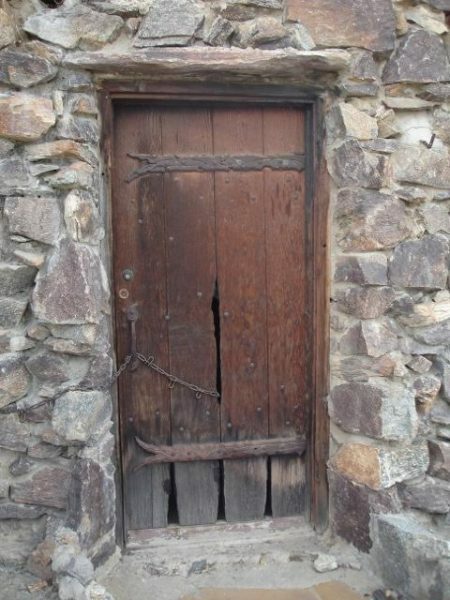 They featured handcrafted doors, windows and shelves, handcrafted ironwork for the door latches, and handmade fireplace tools and anvils, according to an article in the June, 1992, Palm Springs Life. Writer Margo Matteas talked to Toni King, a New York hairstylist who served a celebrity clientele at her salon in downtown Palm Springs. King lived in one of the Araby cottages for more than 30 years. Some of the masonry around the houses was stamped with Hopi designs. There’s also an equestrian motif, with horseshoes and tie rings embedded in the concrete. The floors were a psychedelic swirl of green, yellow, blue and pink rock. “It’s still a mystery as to his method,” resident Toni King said. While I appreciate this Nature Boy portrayal of Miller, it doesn’t quite fit the society dandy in the photos. 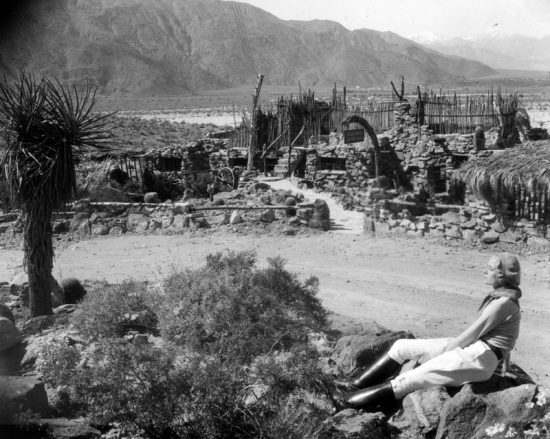 It’s possible the flamboyant Toni King was building her own mythology–or it’s possible R. Lee Miller was exactly as described: an ecstatic shaman-architect making mad leaps up Tahquitz Falls. The rock village seemed to have a special draw for women. One of the original residents, Perle Wheeler Martin, lived in the Casa Contenta house for years. After her came the stylish Swedish artist and arts patron Christina Lillian. 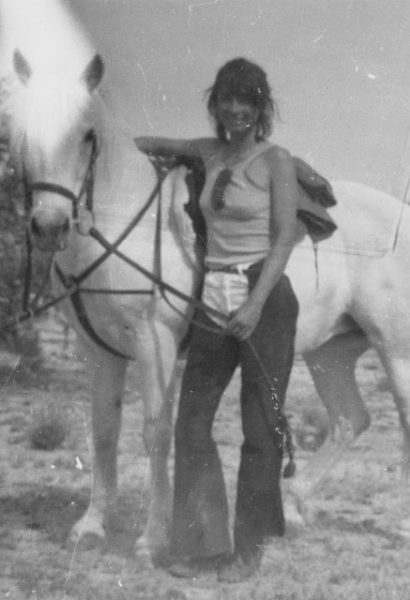 Then there was Toni King, an expert horsewoman who threw big parties at the house she called The Cave. Another resident of 25 years, Virginia Moore, was a Chicago transplant and former fashion model. Both she and Toni King enjoyed sleeping on the roofs of their houses (there’s even a rooftop barbecue grill) and carrying around shotguns to chase away intruders. Toni King would arise from her rooftop boudoir and go horseback riding at dawn on her big bay, Abner. I finally got to visit The Shire one day, after years of ruminating on the colony from afar. A current owner allowed me access and I was both charmed and dismayed by the view up close. 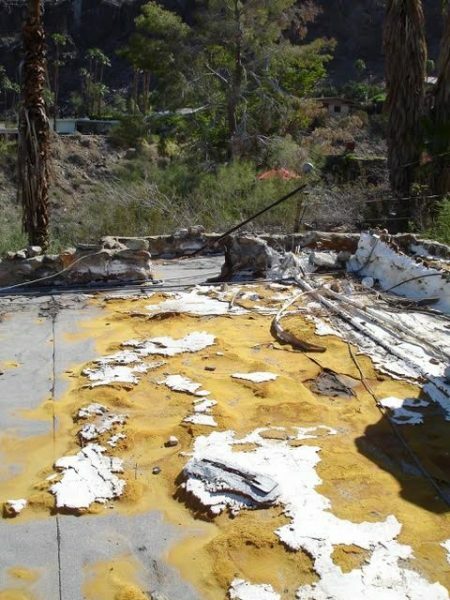 It was clear that all but one of the houses had been neglected for some time, with boarded-up windows, crumbling rock walls, dead landscaping and shredded roofs. Palm Springs–the City that mobilizes to save everything midcentury–seems not to have noticed this handmade hobbitville slipping away. But since that visit in the spring of 2016, hope has arrived in the form of actor and artist Rudy de Rooy. 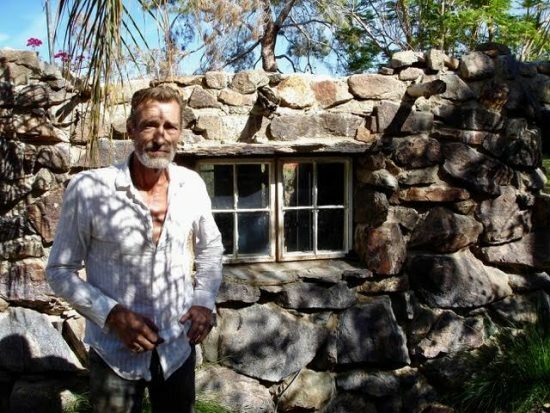 It was local artist Terry Masters (owner of the Desertpainter Gallery at 370 N. Palm Canyon Drive) who suggested Rudy take a look at the rock houses. Rudy contacted the owner and started trimming away brush until a beautiful little stone cottage emerged from the undergrowth. Rudy moved into Burt Procter’s former home after hauling out tons of debris and “more dead animals than I’ve ever seen in my life.” For now, Rudy de Rooy is the able custodian of R. Lee Miller’s vision. Burt Procter’s photo of the rock house where he lived. 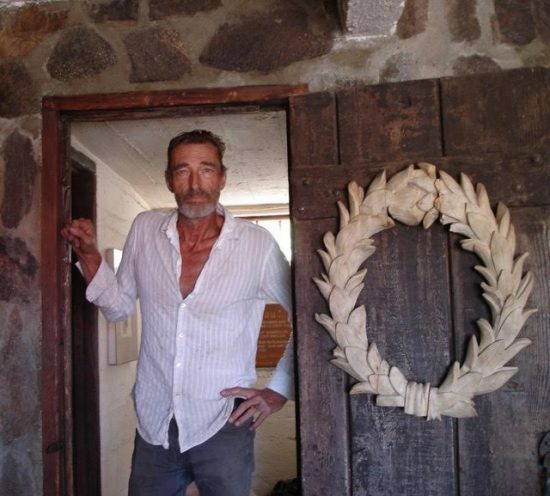 Rudy de Rooy in the rock house, after clean-up. another excellent piece. i’ve wondered where the association with the word ‘Araby’ came from for these homes and a street named Araby in south Palm Springs. as the extract below from a scholarly article describes, the ‘Araby Bazaar’ was a large fair held in Dublin in the late 1800s into the 1900s. It might have passed into obscurity, except that James Joyce named one of his short stories, in ‘Dubliners’, for it. The Araby Bazaar, along with the other charity bazaars held in the city, became something of a Dublin institution during the middle of the 1890s. This is demonstrated by, among other indicators, the extent of the press coverage they received each year. The Irish Times, for example, published lengthy preview articles about each bazaar during the weeks before they opened, and almost daily reports on the proceedings after they had been launched. These [End Page 17] reports included detailed accounts of all the volunteers working at the bazaar, along with full descriptions of the design and layout and daily attendance-totals in addition to first-person accounts of the ‘sensation’ of participating in the events. The Lady of the House, Ireland’s only ladies’ journal, published even more detailed accounts of the bazaars, along with some photographs. The Illustrograph, a short-lived photographic magazine dedicated to improving Ireland’s tourist trade, published a series of very high-quality images from the bazaars, some of which are reproduced in this article. There was a time when architecture (or rather, architects) did not need to make a statement which dissociated from the natural environment. Structures growing out of the landscape, barely visible, are, to me, serving with respect and imagination what most do not, the need to be seen over-riding other considerations of which there are many, none of them wise, many harmful. Lee Miller’s genius and love for structure is equaled by his humility. This might also describe the author of this fascinating, wonderful, important story. Thanks for it, Ann – it’s an over-the-top, tour- de- force you’ve somehow managed to piece together. Let’s go help Rudy! your rock trail’ less travelled story has stayed with me since first reading it yesterday, dear ann. wonderful! please continue to bring treasures like r. lee miller’s work(s) to my screen. You have outdone yourself and all others before you with this one, Ann. Thank You! I recently had the pleasure of viewing the village from Araby Dr. I asked a good friend about them and if he had any history which led to forwarding this article.